As I attempt to get back on track with my Blogging Along with Just Another Mom series (or at least that’s what I’m tentatively calling it), I wanted to talk about reasons to blog. 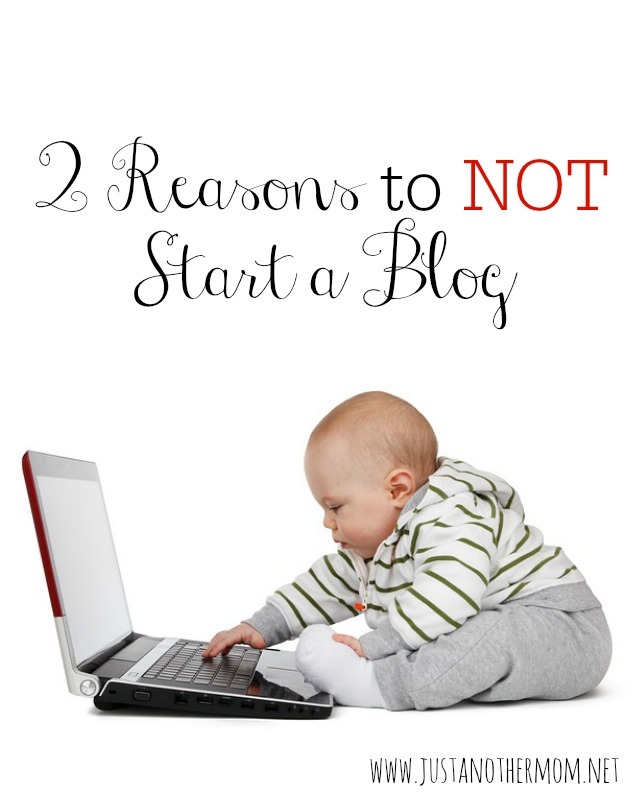 Or, rather, I wanted to talk about 2 reasons to not start a blog. Why, you may ask? Because it was something that I worked hard to avoid and yet still somewhat got caught in the trap of when I decided I was going to monetize. My hope is that this post will help others or those thinking of starting a blog from making the same mistake. Of course, I’ll also get into reasons why you should start a blog but let’s get to those 2 reasons to not start a blog. 1. For the money. Blogging is not a get rich quick scheme. You will not make money overnight and if anyone tries to tell you this- don’t listen to it. Is it possible to make a living with blogging? Yes, of course it is. But not without hard work. Blogging is a business that requires a significant time investment and it’s also very easy to get burned out from blogging. Chances are that you will also have to invest money to make a little money. And by investments, I mean things like hosting, a domain name, etc. And the biggest investment you’ll make in blogging? Time. Blogging can be incredibly time consuming- from content creation to social media promotion to everything in between. Blogging takes time. 2. For the free stuff. If you see some successful review bloggers out there talking about the latest kitchen gadgets or kids toys and think- I want to start a blog to get free stuff- STOP. You still have to pay taxes on that free stuff, so it’s not really free. And being a review blogger might also mean having some tight deadlines to meet. The lure of being a review blogger caught me during holiday time when I thought- hey, this is a great way to get some presents. And it was… but it was also incredibly time consuming and stressful. I’m not cut out to be a review blogger because I don’t have the time. But does it work for others? Of course it does. Just don’t start a blog just because you want the free stuff. So those are 2 reasons to not start a blog, be sure to join me next Monday when I cover a few reasons why to start a blog. I had thought about starting a blog to get free stuff. I realized I could never do it because I am way too unorganized and have a difficult time staying on a schedule! I’d rather enter contests to get free stuff. No interest in being a blogger, but I appreciate those who do. Great points! You have to have your whole heart into your blog, your purpose, and your message. These 2 reasons definitely do not make for a very heartfelt blogging experience and make it simply a chore. Thanks for this amazing post and have a wonderful weekend! Thank you so much, Sara! Have a lovely weekend. AMEN. I was blogging as a hobby before I decided to go all-out. Now that I actually have money invested in it, I’m trying to make it work and boy is it a time-commitment. Especially when you already have a full time job. It’s been a rough 2 months, but I’m not burnt out yet…still have plenty of ideas and I started it because I thoroughly enjoy it, not because I want the money (though a little extra cash will be nice…once that starts happening). Both great tips. I don’t do reviews either, but I have monetized my blog. Definitely not a quick way to make money! But, I love blogging, so all of the time spent is worthwhile to me. You make some good points to consider – thank you for sharing. I am doing this with the main goal of long term financial potential, but I have figured out that I need to make sure to focus on my own personal goals. I think otherwise you run out of things to post – just like you all are saying, takes heartfelt commitment. Good points on the taxes and time commitment for product reviews. Did not consider that! Great tips, Kori. If you do start a blog for those two reasons, there is a 99% probability you will quit before you see a return in either department. This is so true! I’ve been blogging a long time and still don’t make much. Most of the bloggers I know who are making a full-time income are also working around 80 hours per week, or at least did for the first few years.